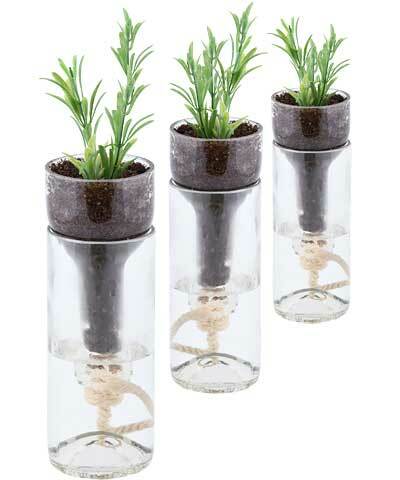 Doubly add a green element to your home using these Esschert Design Self-Watering Bottle Planters. This package of 3 unique planters not only supports seedlings; it also reduces waste by diminishing water use and repurposing wine bottles. Each item is crafted from a cut wine bottle, with its top section inverted to create a cup. Fill this section with potting soil or planting media, which will remain in place thanks to the included cork stopper in the neck. These top sections rest nicely inside the cylindrical bases, which can be filled with water to create reservoirs. A bit of rope extends from either side of the cork stopper, enabling one end to rest in the water, and the other to stretch upward into the soil. Capillary action from the plant roots will pull water from the twine as needed, for proper and lasting hydration. The three, clear glass units keep water levels visible at a glance, and the top sections lift in moments for easy refilling. Place these planters in a windowsill to encourage seedlings to grow, or line them on a table for a focal point. Showcase plants in a fun and green way with these Self-Watering Bottle Planters. Note: This case pack contains 3 of the Esschert Design Self-Watering Bottle Planters.